Self-Portrait (Autorretrato)(1952) Rosa Rolanda, oil on canvas, Acervo Museo de Arte Moderno/INBA, © Courtesy of El Instituto Nacional de Bellas Artes Y Literatura, 2017. On view at the Dallas Museum of Art. From American photographs in Oregon and the Whitney Biennial in New York to Whistler in Illinois and Giacometti in North Carolina, a fresh crop of art exhibits is springing up across the country. Side Chair (1940) by Eero Saarinen and Charles Eames. On view at the Cranbrook Art Museum in Michigan. La Talaverita, Sunday Morning NY Times (2016) by Aliza Nisenbaum. Oil on linen. On view at the Whitney in New York. Installation view: Tomás Saraceno: Stillness in Motion – Cloud Cities (2016), on view at the San Francisco Museum of Modern Art. Photo: © Studio Tomás Saraceno. 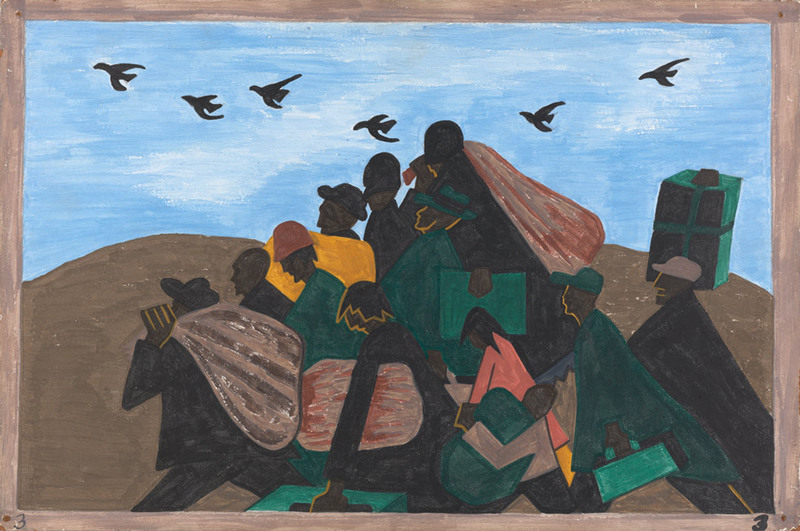 The Migration Series, Panel 18: The migration gained in momentum (1940–41) by Jacob Lawrence, casein tempera on hardboard. © 2016 The Jacob and Gwendolyn Knight Lawrence Foundation.